The 107.4 metre explorer yacht Ulysses, jointly listed for sale by Fraser and Burgess, has been sold with Burgess introducing the buyer. Built in steel and aluminium by Norwegian commercial yard Kleven Verft to Passenger Class Rules with a design by Oscar Mike, she was delivered in March 2016 as an ice classed, world-girdling explorer yacht. Her 2,230 square metres of interior space has décor by H2 Yacht Design and she accommodates 30 guests in 15 suites including an entire deck dedicated to the owner. In addition, there are quarters for 42 crew in 22 cabins. Facilities on board include eight dining locations, both inside and al fresco, and she has a total of five bars. A fully certified helicopter landing platform has a hangar including a refuelling station and there is also a professional cinema with a stereo surround sound system. For convenience, there is a 13-person guest elevator serving all decks along with a separate eight-person elevator for crew. 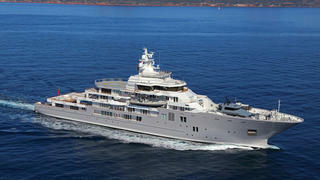 For charter purposes, Ulysses is approved to carry 36 guests on charter voyages. Twin diesel electric Caterpillar engines give her a cruising speed of 15 knots and and an enormous range of 8,500 nautical miles. For maximum comfort at sea and in port, she is fitted with zero-speed stabilisers. The asking price of Ulysses has been witheld.